Having agreed to Putin's conditions of not making additional revelations, NSA whistleblower Edward Snowden packed his bag and moved to an undisclosed location somewhere in Russia after having been granted temporary asylum. The revelations continued anyway as the Guardian released another top secret document detailing another NSA spying program called XKEYSCORE. The heavily redacted XKEYSCORE document details how the NSA searches internet users actual communications contents as opposed to metadata. The details of this program proved without a doubt that NSA analysts can read, see and hear the content of American's communications without a warrant by simply claiming they suspect that the source might be somehow foreign. Edward Snowden claimed he could completely monitor any citizen without oversight, a claim which was denied all round the national security establishment. His claims have now been proved true. 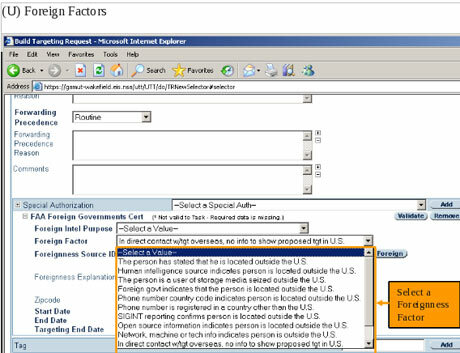 A simple multiple choice drop down menu [View Here] is integrated into the spying software interface so that an analyst may select a judicially pre-approved “reason” to monitor every single thing a person does on the internet. Meanwhile the denials and obfuscations flew around Washington as intelligence leaders defended the program while President Obama derailed Congressional hearings by inviting key Democrat leaders to a closed White House meeting on the topic. Nearly simultaneously the State Department closed embassies and issued travel warnings in response to alleged terrorist “communications chatter” in a move reminiscent of the Bush Administration's highly political use of bogus and vague terror alerts. It's not clear if this recent alert will be used as fodder to justify spying on the whole world when these nebulous terrorist threats fail to materialize as they always do. While war criminal Dianne Feinstein took her photo-op during a Senate hearing holding a poster claiming that 54 terrorist plots had been foiled by the warrant-less intrusion into the communications of nearly everyone on the internet, some senators who were shown a classified list of plots that had been foiled. Senator Leahy (D-VT.) was not impressed and said so during a hearing on Friday "If this program is not effective, it has to end. So far, I'm not convinced by what I've seen." Senator Al Franken, a noted liberal from Minnesota supports the program continuing but wants more transparency. He is planning to co-sponsor a bill that would require reports on how many Americans had been targeted. He apparently expects that Congress will be told the truth by the NSA, which claimed last month that it could not search its own email. The head of the NSA, General James Clapper, claimed in June that the NSA did not collect data on Americans while testifying before Congress. Congress has yet to discuss charging him with any crime. Franken's new position differs little from his earlier blanket support for the program and its secrecy. On a television station in his home state he said "I have a high level of confidence that this is used ... to protect us, and I know that it has been successful in preventing terrorism." However he has not called for an end to the program, nor has be publicly questioned the NSA's reporting on its utility. It is not clear if Senators Leahy and Franken read the same briefing. Senator Franken's definition of transparency seems to extend only as far as declassifying the secret court orders and memos that underpin the dubious legality of the Administration's vast and ever expanding empire of surveillance. While various intelligence agency officials briefed Congress mostly behind closed doors, Democratic leaders were whisked off to a surprise closed door discussion with the president where he listened concerns and made no commitments to change. According to the Denver Post Senator Mark Udall said President Obama “listened carefully to my proposal to significantly scale back the 215 program.” The president made no commitment to actually changing anything. Udall continued “There was no timeline, nor commitment to any specific changes. We did though agree that we had a month to continue conversations among all the various participants and that when we came back in September … we would reengage and see where we could find some agreement.” Thus national conversation that Obama claimed he welcomed consisted of feigned active listening behind closed doors. Udall had been a more vocal opponent of the various NSA programs in the beginning of the Snowden revelations, although his counterpart from Oregon Ron Wyden seems to have taken the forefront of public antagonism since the death Udall's brother James “Randy” Udall while hiking alone in Wyoming in late June. Udall's death mirrors the mysterious death of metacarta software author Eric Rauch in 2005. A Congressional proposal to completely defund the spying program was narrowly defeated last week before the most recent round of revelations. With Senate Democrats cowed and seeking multiple half measures, it is not clear how any meaningful curbs can be placed on post-constitutional America's worldwide spying empire.